IT IS RACE DAY! Bring On The Sprint Cars!! With racing at Macon Speedway, there is definitely no down time. After the show of the year on Tuesday night with the St. Louis U-Pic-A-Part 100 for the Lucas Oil Late Model Dirt Series, attention turns quickly to the wicked fast Neal Tire MOWA Sprint Cars. In their only visit of the season, the MOWA Winged Sprints finish up their Illinois Sprint Week at Mighty Macon. 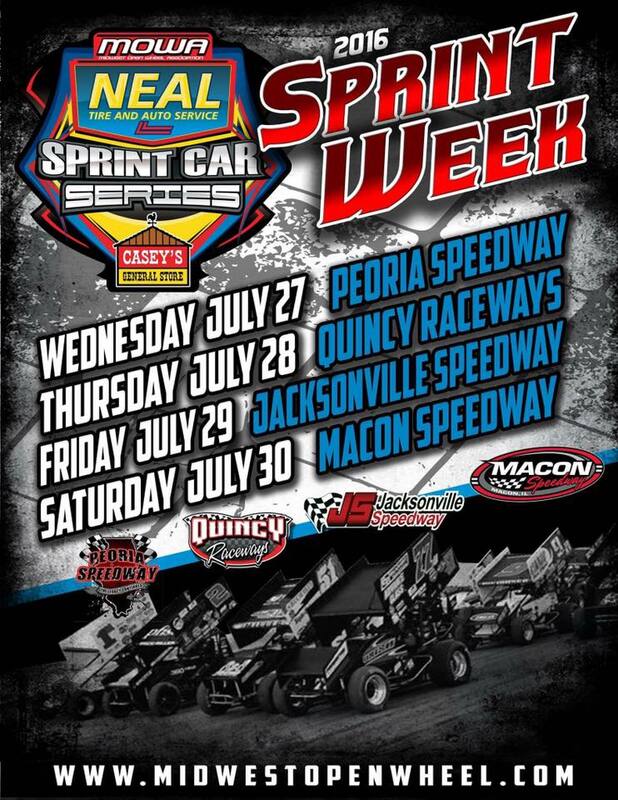 It all begins on Wednesday night, July 27 with the Illinois Sprint Week opener at Peoria Speedway. The field of stars then travel to Quincy Raceways on Thursday night before heading to Jacksonville on Friday. It all comes to an end with the Sprint Week finale on Saturday night. Last year’s MOWA show at Macon was an absolute thriller as Adam Jones and Parker Price-Miller battled it out, trading the lead in the final laps. The war also included a 360 spin but the green stayed out which added to the thrilling finish. Eventually, it was Jones, from Wright City, MO who claimed the win by inches over Price-Miller. This Saturday’s appearance will see Big 10 Pro Late Models, POWRi/Illini D-II Midgets, Beach House Micros, and Hornets in addition to the winged sprints. Pit gates will open at 4:00, grandstands at 5:00, local division pill draw ends at 5:50, hotlaps begin at 6:00, and racing will take the green at 7:00. Grandstand admission will be $18 for adults and free for kids 11 and under.